As a left handed crocheter, I was hesitant to try teaching when I knew most of my students would be right handed. But about 12 years ago I gave it a try and discovered that being left handed just meant I could teach both lefties and righties. I love being able to share my passion with others! Yesterday I had the first of many Crochet Classes I will be holding in the next month as the MOMS Club of Camas begins our next donation for the Remembering Rowan Project. Six students of varying experience gathered in my craft studio, from my 20 year old cousin who I taught to crochet when she was just 11, to a friend who did not get to learn when I taught the MOMS Club back in 2008 and was eager to finally get started. 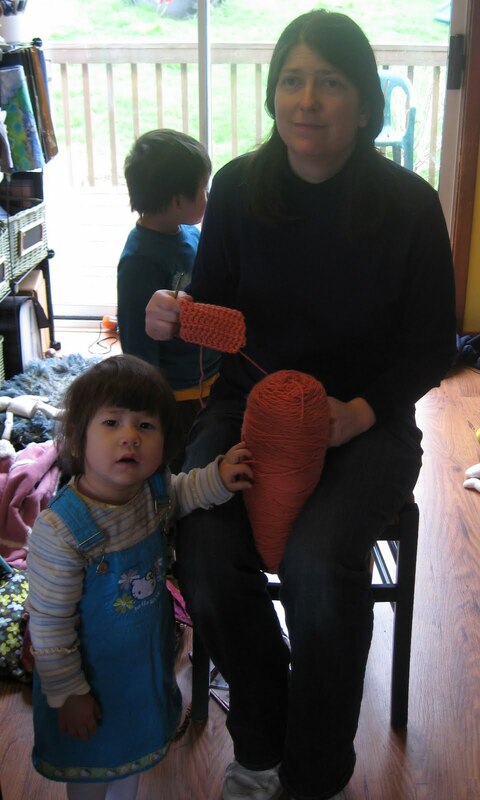 I walked them each through their first double crochet stitches while six wee kidlets played at our feet. I started them with swatch squares, to determine what size hook they should use for working up Rowan's Sampler Afghan. The one who was a total beginner plans to continue her swatch to make a scarf while she is traveling for spring vacation. By the time she get back she will be very comfortable with double crochets and ready to begin her Sampler Afghan. To spread the word about my CAL (Crochet Along), I started a thread on Crochetville, an amazing online community for crocheters. Check it out for inspiration, information on all things crochet, and even how to videos.